Harlan Ellison is most often associated with science fiction. That’s understandable, of course. He is the author of some of the greatest science fiction stories ever written, like “‘Repent, Harlequin!’ Said the Ticktockman” (1965) and “A Boy and His Dog” (the 1969 short story made into a film in 1974). He also wrote legendary screenplays like the “Demon with a Glass Hand” episode of Outer Limits (1964) and the revered “The City on the Edge of Forever” episode for Star Trek (1967). In addition, Harlan Ellison has edited some of the world’s most famous anthologies of science fiction short stories, like the game-changing collection Dangerous Visions (1967). But during his long career as a professional writer, which began in earnest in the mid-1950s, Harlan has actually written many different types of fiction and non-fiction. 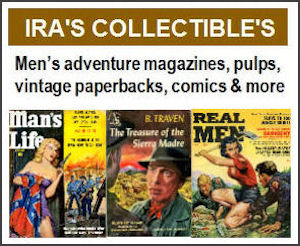 Along the way, Harlan also had a few stories published in men’s adventure magazines. However, those have not been reprinted and were essentially “lost” — until recently. 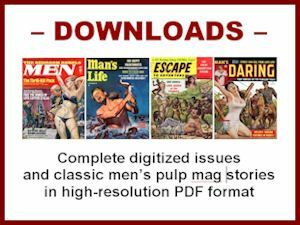 Last last year, on this blog, I mentioned two Harlan Ellison stories I was surprised to find in men’s adventure magazines: “I Raped Freedom in Budapest,” a faux, as-told-to “true story” published in the August 1957 issue of Battle Cry and “Death Climb,” a noir thriller first published in the February 1957 issue True Men Stories. I was even more surprised when Harlan Ellison contacted me, after someone told him I’d mentioned those stories. That initial contact resulted in several incredibly interesting phone calls with Harlan. In his own inimitable, mind-blowing, curmudgeonly way (see the documentary Harlan Ellison: Dreams With Sharp Teeth if you don’t know what I mean), Harlan regaled me with tales of his days in New York City in the late 1950s, when he was writing stories for virtually every type of magazine — including men’s adventure magazines and even women’s “True Confessions” style mags. Harlan also told me some stories about famous writers, actors and directors he knew and hung out with after he moved to California in 1962. 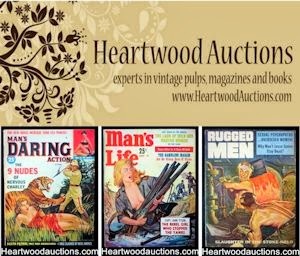 In between laughing, being amazed and making sure my tape recorder was working, I asked Harlan if I could reprint the stories he’d written for men’s adventure magazines. He said his story “I Raped Freedom in Budapest” is scheduled to be reprinted for the first time in an upcoming book, so he wanted me to wait on that one. 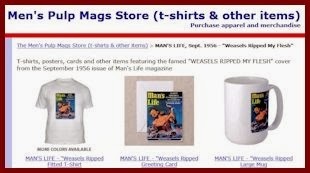 I must note that I paid Harlan for the online reprint rights to those stories. And, he was very nice about making it affordable for me. I also signed a contract outlining how I would make those stories available, in a password-protected PDF format with the proper copyright information. With this post, I am making them available online for the first time. In future posts, I’ll tell you more about the stories and relate some anecdotes Harlan told me. ● Harlan Ellison’s “Death Climb,” a noir-style pulp fiction tale originally published in the February 1957 issue True Men Stories. ● Harlan Ellison’s “The Island of Tyooah,” an exotic South Seas fantasy yarn originally published in the second issue of Exotic Adventures magazine, Vol. 1, No. 2 (1958). And, yeah, damn skippy, you gotta pay to read them. Not much — just 99 cents each. But hell, do you think I would write this blog just to get calls from guys like Harlan Ellison? Well, OK, I probably would. 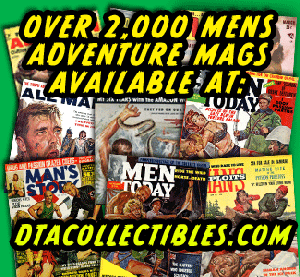 But by buying Harlan Ellison’s lost men’s adventure magazine stories, you can help support this blog — and I will be able to buy more men’s adventure magazines to feature here for your reading pleasure.